Color(s): Brindle, fawn, white, gray, black; solid, parti, or tri-colored. Originating in the USSR, this ancient working breed was, and continues to be, utilized as a guardian of livestock against large predators such as wolves and bear. Central Asian Ovtcharka's are popular in England, Poland, and Italy. However, due to prohibition against their export, the Central Asian Ovtcharka is not well known in the United States and is difficult to obtain. A massive and formidable breed, the Central Asian Ovtcharka is muscular, powerful, and bold. They are well-balanced, fearless, sturdy, and athletic. Occasional brushing is recommended to remove loose and dead hair. Bathing should only be done when absolutely necessary. The Central Asian Ovtcharka breed may be prone to such health issues as hip dysplasia and bloat. 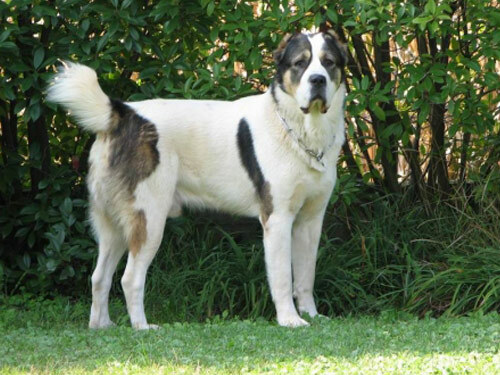 The Central Asian Ovtcharka is a double coat breed that presents in two coat types: Long and Short. The outer coat of the Long Coat variety is coarse and long. There is extra hair on the backs of the hind legs, tail, ears, and neck. The under coat is soft and dense. The Short Coat variety has an outer coat of short, coarse hair. The under coat is soft and dense. The Central Asian Ovtcharka must have early and intense socialization provided they are not being utilized as a flock guardian. This is a dominant breed that requires a knowledgeable owner. Central Asian Ovtcharka's will not tolerate or respond to harsh or heavy-handed methods. Training must be done with respect, firmness, fairness, patience, and consistency. The Central Asian Ovtcharka breed is not recommended for city or apartment living. They are nocturnal barkers. The Central Asian Ovtcharka must be in a rural setting with a job to do and ample room to safely roam.